AutoPlay Media Studio portable delivers on the promise of rapid application development. What would normally take days or weeks to build using traditional software development tools (C, C++, Java, Visual Basic) can now be created in record time – even if you’ve never programmed before. It’s perfect for making anything from AutoPlay CD menus and utilities to games and interactive multimedia applications – complete with web interaction, database connectivity, video playback and much more. 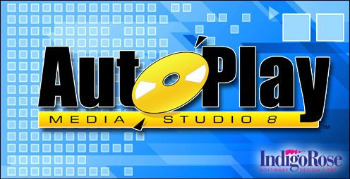 With AutoPlay Media Studio it’s easy to create your own interactive multimedia software. Even if you’re not a “programmer”, you’ll be creating professional projects in no time. It’s all done in a completely visual, drag-and-drop design environment. From images, text and music to video, drop-down lists and web content, you simply move things into place using your mouse. With a built-in library of more than 250 easy to use actions, adding interactivity to your projects is a breeze. Whether you’re a complete novice or a seasoned programmer used to working with Microsoft Visual Basic, Macromedia Director, Microsoft Visual C++ or Borland Delphi, you’ll find that AutoPlay Media Studio 6.0 deserves a place in your toolbox. It’s perfect for making autorun CD/DVD’s, software installer menus, electronic business cards, training material and just about any other interactive multimedia project you can think of! Creating professional multimedia software can be both easy and fun, thanks to AutoPlay Media Studio 6.0. In fact, with our award winning WYSIWYG (what you see is what you get) visual design environment, anyone can do it! Simply drag and drop your media content (text, photos, videos, Macromedia Flash, and much more) onto “pages” and then add interactivity with over 250 built-in actions. It couldn’t be easier! AutoPlay Media Studio makes packaging up and distributing your finished project a snap. Whether you’d like to create a single-file executable for distribution by web download or email, or burn it to a CD/DVD data disc, it just takes a few clicks. You can even choose to publish to ISO CD/DVD images or to a hard drive folder for packing it up with an installer/setup builder. Choose from a variety of ready-to-use projects and then modify them to fit your needs. We include examples of software installer menus, electronic business cards, marketing brochures and many others. It’s also easy to make your own project templates or to add-in templates made by others. It couldn’t be easier to create powerful multimedia applications. We’ve packed the software with wizards, tutorials, a user’s guide, context sensitive help and much more. It’s also backed up with world-class technical support options, online discussion groups, and video training lessons. Feature: Added SHA-256 code signing support. Feature: Added the ability to dual-sign apps (SHA-256 and SHA-1). Feature: Added a password field for the code signing certificate(s). Feature: Added a few items to the ‘System.GetOSProductInfo’ action’s constants. Change: Removed support for signing with signcode.exe, instead use signtool.exe. Fix: Fixed a bug in the ‘Registry.GetValueNames’ action which caused it to fail. Fix: Made an attempt to prevent an occasional build error from occurring duing the manifest injection step due to a timing issue. Fix: Fixed a bug in the ‘ListBox.SetVisible’ action where it was not working correctly if ‘Checklist box’ was enabled. Fix: Made the ‘Clipboard.IsTextAvailable’ plugin action return false if there was a text entry on the clipboard, but it’s data was empty. Updated version to 2.0.2.0. Fix: Fixed an issue where the File Layout dialog could crash in some situations. Fix: Changed references in AutoPlay from Windows Server 10 to Windows Server 2016. Fix: Reset the internal last error code in a location where it was being returned from GetLastError. No actual error was occurring.